Norristown’s location on the Schuylkill River was advantageous for industry. The river provided quick and convenient transportation of manufactured goods into Philadelphia. In the early nineteenth century, it was improved with the opening of the Schuylkill Navigation Company’s canal system. 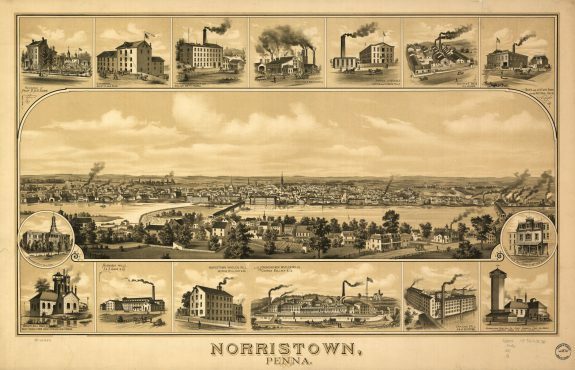 Industry in Norristown was diverse, ranging from breweries and cigar factories to foundries, textile mills, garment factories, paper mills, and flour mills. Industrial jobs drew people, including a large number of immigrants, into the borough. In the latter half of the twentieth century, industry faced a terminal decline in Norristown – and much of the Greater Philadelphia region. Changing manufacturing technology and cheap labor in the southern states left the borough’s mills and factories shuttered and silent. Norristown thrived during the nineteenth century railroad boom. Railways first entered Norristown in 1835 when Matthias Baldwin’s locomotive “Old Ironsides” steamed in on the Philadelphia, Germantown, and Norristown (PGN) Railway. 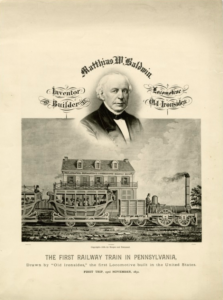 Baldwin, a jeweler turned machinist, entered the locomotive business in 1831 when the Philadelphia Museum commissioned him to build a scale steam locomotive to be exhibited. The next year, he built a full-sized prototype of iron and wood. It traveled at a speed of thirty miles per hour, faster than other prototype locomotives built at that time. Construction began on the PGN in 1831, originally for horse-drawn cars, but did not reach Norristown for several years. It was joined by streetcars lines, first laid down in the 1880s. They connected Norristown to Philadelphia and other nearby towns, and brought the town into the region’s expansive streetcar network. Norristown gained a rapid transit line when the Pennsylvania & Western Railroad was completed. Construction began in 1906 in Upper Darby, Delaware County, the terminus for the newly expanded Market-Frankford Elevated Line just west of Philadelphia, and was completed in 1912. In Norristown, the Pennsylvania & Western connected to the Lehigh Valley Transit Company’s Liberty Bell Line, directly connecting the borough to destinations as distant as Allentown. Of these rail systems, only the Pennsylvania & Western survives. It is now SEPTA’s Norristown High Speed Line and carries over three million passengers every year. A proposed spur line between Norristown, the King of Prussia Mall, and the Valley Forge Casino was undergoing feasibility and environmental impact assessments as of 2016. Norristown’s population peaked in the mid twentieth century. Employment opportunities and convenient transportation drew waves of immigrants throughout the borough’s history. English, Welsh, and German families who arrived in the colonial era were joined by Irish, Jews, and Italians in the nineteenth century. The early twentieth century brought African Americans migrating from the south during the Great Migration. New arrivals found employment in Norristown’s bustling, diverse industrial sector. By 1960, the population had swelled to over thirty-eight thousand. Norristown’s Main Street–the central street running left to right in this 1930 photograph–became a hub of retail and entertainment venues that brought in patrons from nearby towns. Deindustrialization, suburbanization, and decline of the railroads were just some of the factors that sent Norristown into a decline in the latter half of the twentieth century. Norristown’s transportation advantage began to dwindle with the construction of highways in the Philadelphia area. Automobiles gradually supplanted the area’s railways and streetcar lines in the early half of the twentieth century, leading to congestion throughout the entire Greater Philadelphia region. A network of highways was planned in the 1940s and promoted heavily at the 1947 Better Philadelphia Exhibition curated by city planner Ed Bacon. 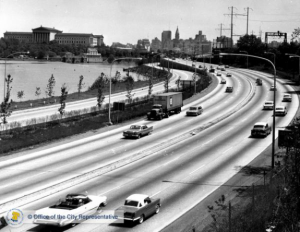 The Schuylkill Expressway, shown here, was one of the first to be realized. Construction began in 1949 and continued for a decade. The 1956 Federal-Aid Highway Act, under which the federal government provided 90 percent of the funding for new highway construction, fueled enthusiasm for further construction. Some plans were later altered or scrapped completely in the wake of the freeway revolts of the 1960s and 1970s. Three of the completed highways bisect Montgomery County. All three of them bypass Norristown. The Pennsylvania Turnpike, stretching east to west across the state, and the Schuylkill Expressway were both routed through King of Prussia. I-476, locally known as the Blue Route, traverses Conshohocken and Plymouth Meeting to the east. Customers who once frequented Norristown’s department stores and entertainment venues instead spent their disposable income at newer retail centers like the King of Prussia Mall, which opened in 1963. Highways also encouraged wealthier residents to leave older suburbs built on rail and streetcar lines for more distant developments accessible only by automobile. These factors along with a decline of industry threw Norristown into a decline. Crime and poverty soon followed. Norristown has a link to Mother Teresa, who founded the Missionaries of Charity, a Roman Catholic religious order dedicated to providing “free services to the poorest of the poor.” Born in Macedonia in 1910, she left her family’s home at the age of eighteen to join the Sisters of Loreto in Ireland. In 1931, she travelled to Calcutta, India, to take her vows as a nun. She taught at local schools and eventually founded her own charity school for the children of the slum neighborhoods. 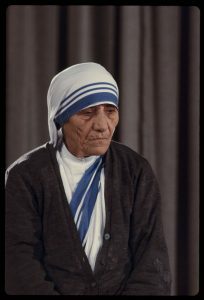 In 1950, with the guidance of the Archdiocese of Calcutta, she established the Missionaries of Charity to provide free care and education to society’s most impoverished and needy including prostitutes, orphaned children, homeless people, lepers, the mentally ill, and AIDS patients. In 1979, she was awarded the Nobel Peace Prize for her charitable work. The Missionaries of Charity spread in the following decades and in 1984, they were invited by the Archdiocese of Philadelphia to open a branch in Norristown. 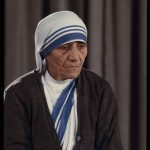 Initially some community members opposed believing it would draw homeless into the city, but opinions were swayed when Mother Teresa personally visited in October of that year and spoke to a crowd of over a thousand. In 2016, the Missionaries of Charity still operated a shelter for women and children and a soup kitchen in the town, with the help of local volunteers. Another home in nearby Chester serves women with HIV/AIDS and their children. Mother Teresa died in 1997, but the order she founded continues to grow. Today over five hundred branches operate across the globe. Norristown bills itself as "the Heart of Montgomery County." 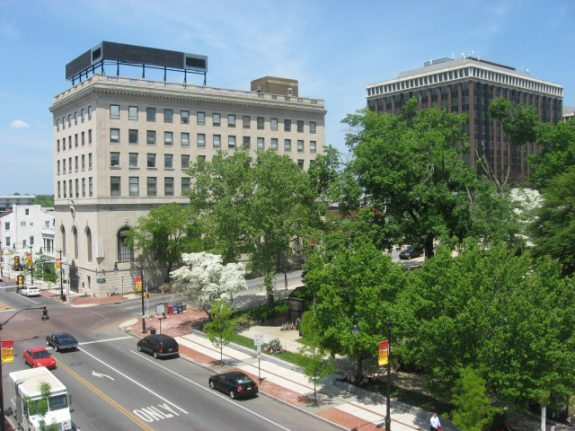 Much of Norristown's modern economy is based in government, healthcare, and legal and social services. 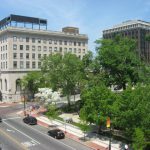 After a long period of decline, Norristown's downtown began to see a resurgence and diversification in the last decade of the twentieth century. Legal offices serving the Municipal Courthouse line the Main Street area, and smaller businesses serving the lawyers, hospitals, and their clientele have thrived in recent years. Beginning in the 1990s, arts and theater companies also established successful ventures in downtown Norristown. Despite its continued high poverty levels, Norristown's unemployment rate was below the state average in 2016. 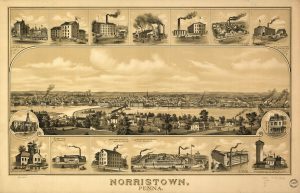 Founded in 1784 as the county seat of Montgomery County, Norristown sits on three hills that slope down to the Schuylkill River fifteen miles northwest of Center City Philadelphia. Its riverfront location and abundant waterpower helped the town prosper throughout the nineteenth century and much of the twentieth. 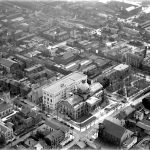 In the second half of the twentieth century, however, social and economic change undercut Norristown’s manufacturing and commercial base, turning it from a flourishing regional hub into the impoverished county seat of one of America’s richest counties. Pennsylvania proprietor William Penn (1644-1718) bought the land that became Norristown from the native Lenni Lenape. On October 2, 1704, Penn gave his son William Penn Jr. (1681-1729) a 7,482-acre tract that he called the Manor of Williamstadt. Just five days later, the younger Penn sold Williamstadt to merchants Isaac Norris (1671-1735) and Willam Trent (1653-1724) for 850 pounds. Trent sold his share to Norris in January 1712 for 500 pounds. In 1730, the Court of Quarter Sessions for Philadelphia County ordered the name of the tract changed from Manor of Williamstadt to Norriton Township. The new settlement was well-situated for success. The canoe-navigable Schuylkill, a natural passage from Philadelphia into Pennsylvania’s rich interior, developed into a highway for transporting farm products and coal to the city. Stony Creek and Saw Mill Run, two tributaries of the Schuylkill, offered an abundant source of water power for mills of all sorts. Norriton, which was part of Philadelphia County, grew quickly, increasing from just twenty landholders and tenants in 1734 to 380 by 1749. As the outlying reaches of Philadelphia County grew steadily in population, residents began to complain to the General Assembly that the courts in the city of Philadelphia were too far away and petitioned for a new county, with a more conveniently located county seat. Some petitioners wanted the new county to be created solely from land within Philadelphia County, while others wanted it carved out of parts of Philadelphia, Chester and Berks Counties, with a county seat at Pottstown. On Sept. 10, 1784, the Assembly created Montgomery County, taking the land exclusively from Philadelphia, and ordered a courthouse and jail built along Stony Run, on four acres that the university gave “as a free gift” for that purpose. The school also agreed to lay out a twenty-eight-acre county seat, to be called the Town of Norris, with sixty-four building lots for sale. The Town of Norris had only twenty houses by 1790, but the residents had big ambitions. In 1812, they asked Gov. Simon Snyder (1759-1819) for permission to incorporate as a borough–the first in Montgomery County. Snyder agreed, and the Town of Norris, expanded to 250 acres, became the Borough of Norristown on March 31, 1812, governed by a burgess and borough council. 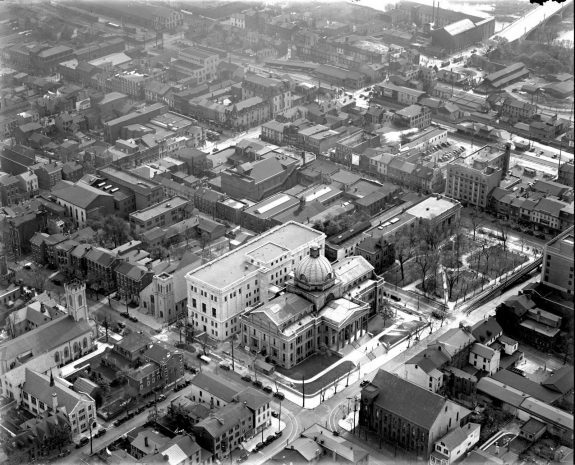 In 1853, the borough added another two thousand acres, bringing Norristown to its modern area of 3.6 square miles. Looking for a symbol that would tell the world what Norristown was all about, borough officials commissioned William Kneass (1781-1840), chief engraver of the U.S. Mint in Philadelphia, to come up with an official seal. Kneass depicted a dome-shaped straw beehive under the Latin motto “Fervet opus”–literally, “The work boils.” The design was apt for a town that wore its hard-working heart on its rolled-up sleeve. For much of its history, the work did, indeed, boil as Norristown bustled with industry and retail trade. Textile mills, sawmills, and grist mills all flourished through the nineteenth and into the twentieth century. The town’s products included textiles, paper, iron, steel, shirts, shoes, beer, cigars, tacks, flour, lumber, plastics, rubber, animal feed, and even bubblegum. Through the first half of the twentieth century, the variety of Norristown’s industry remained a source of civic pride. The borough also became the county’s marketplace. The number of stores in the town increased from forty-four in 1840 to nearly three hundred in 1883, along with twenty-nine hotels, thirteen restaurants and eight liquor stores. Norristown’s riverfront location provided a means to move the goods it manufactured downstream to Philadelphia. In the early nineteenth century, Norristown and other towns along the Schuylkill got a boost from the construction of a series of canals owned by the Schuylkill Navigation Company. By 1857, more than a million tons of freight moved each year through the canal system, which ran from Port Carbon in Schuylkill County all the way to Philadelphia. Stagecoaches and, later, railroads also connected Norristown to Philadelphia, enhancing the borough’s status as a marketplace. 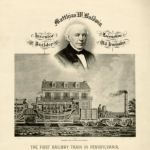 The first railroad service came to Norristown in 1835 with the arrival of the locomotive Old Ironsides on the Philadelphia, Germantown and Norristown Railroad. The borough gained trolley service in the 1880s, and the Philadelphia & Western Railroad, later SEPTA’s Norristown High Speed Line, began service in 1912. With so many ways to get to Norristown and so many jobs beckoning in the mills and factories, the borough’s population grew steadily. The census of 1820 found Norristown with a population of 827, but by 1850, it was up to 6,026, a sevenfold increase. By 1900, Norristown’s population had climbed to 22,265. It was a heady time for the town, which proudly described itself as “the Biggest Borough in the World.” Population peaked at 38,925 in 1960 before declining to 30,749 in 1990 and rebounding to 34,324 in 2010, largely on the strength of Hispanic immigration. Wave after wave of immigrants flocked to Norristown in the nineteenth and twentieth centuries. They joined the English, Germans, Scots, Welsh, Dutch, and Swedes who had arrived during colonial times. In the mid-nineteenth century, large numbers of Irish settled in Norristown, followed toward the end of the century by Jews and Italians. So many immigrants were arriving, that by 1910 14.4 percent of the borough’s population was foreign-born whites. Norristown also became a destination for African Americans leaving the South during the Great Migration of the early twentieth century until by 1950 they made up 8.1 percent of the population. Like other newcomers, they looked for work in the factories and mills. Some local enterprises, such as the Alan Wood Steel Co. in nearby Conshohocken, recruited black workers from other parts of the country. Meanwhile, the number of foreign-born whites in Norristown decreased, reflecting changes in immigration patterns, from 13.6 percent of the population in 1900 to 7.5 percent in 1950. As the mid-century mark passed, whites began moving out of Norristown for the surrounding suburbs. By 1960, Norristown was 12.4 percent black, and by 1970 the black population was up to 21.9 percent. The percentage kept climbing, until by 2010, African Americans made up 35.9 percent of Norristown’s population. Norristown was never more prosperous and proud than in 1912 when it celebrated its centennial as a borough with a grand parade and pageant, but in the next century the borough’s fortunes declined. Cracks began to develop in the borough’s industrial base over the first few decades of the twentieth century when the textile mills that had been a major part of Norristown’s early economic strength began to move south and cigar makers were unable to keep up with the cost of new technology. In the years after World War II, more businesses relocated. 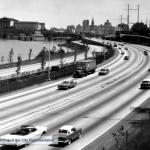 Norristown also lost the transportation advantage that had been so important to its success when the new network of highways–the Pennsylvania Turnpike, the Schuylkill Expressway, and the Blue Route (I-476)–all skirted the borough. The downtown area, which at mid-century boasted two department stores, several theaters, and block after block of shops, suffered as customers shopped instead in the 1960s in suburban malls like King of Prussia and Plymouth Meeting. Economic decline brought poverty. By 2010, the poverty rate reached 21.7 percent, compared to 7.1 percent for Montgomery County. Median household income for Norristown was $42,296 in 2014, compared to $79,926 for the county. Norristown had some problems adjusting to the new reality. The town had an uncomfortable moment in the spotlight in 1984 when the Archdiocese of Philadelphia invited the order of nuns founded by Mother Teresa (1910-97) to open a soup kitchen and shelter in the town. Some local officials balked, fearing that the kitchen and shelter would draw the homeless to Norristown, but the Nobel Peace Prize winner —and later, saint—came to town herself, and resistance melted after she met with local officials. The turn of the twenty-first century marked a new surge of immigration to Norristown as Latinos, mostly Mexicans, arrived in large numbers. Hispanics numbered only 828 in 1990, or 2.7 percent of the population. By 2000, 3,282 persons of Hispanic descent lived in Norristown, or 10.5 percent of the population. By 2010, the number had risen to more than 9,700, or 28.3 percent of the total. As the town struggled with economic decline, Norristown residents voted in a 1983 referendum to scrap their borough status and become a home-rule municipality, allowing more local control over public affairs. The change took effect in 1986. Norristown switched from government by a burgess (mayor) and twelve-member council to government by a mayor with more power and a seven-member council. The power of the mayor’s office soon became a matter of controversy as spending outpaced revenues, debt piled up, and the town narrowly averted bankruptcy. In 2004, a referendum abolished the office of mayor, leaving government in the hands of the council and an appointed municipal administrator. As if to underscore the hazards of the strong mayor system, a federal probe led to the conviction in 2006 of a former mayor, a former borough manager, a former borough council member, and five local businessmen on charges including bribery and tax evasion. Government, health care and legal and social services made up the base of Norristown’s economy in the second decade of the twenty-first century. County government was the town’s largest employer. Despite the high poverty rate, Norristown’s unemployment rate in mid-2016 was 5.1 percent – above the national rate of 4.7 percent but below the Pennsylvania average of 5.5 percent. A promising development for Norristown was the return of theater to downtown. The Centre Theater, which opened in an old Odd Fellows Hall at 208 DeKalb Street in 1996, served as a home for several theatrical troupes and arts groups. The performing company Theatre Horizon moved to Norristown in 2009. The troupe first staged its productions at the Centre Theater but moved in 2012 to the old Verizon building at 401 DeKalb. For nearly twenty years, the Centre Theater also served as home to the Iron Age Theater Company, which was founded in Philadelphia and moved to Norristown in 1995. Beginning in 2014, the troupe staged its productions in various venues in Norristown and Philadelphia. However, efforts to start a movie studio in the old Logan Square shopping center at Johnson Highway and Markley Street foundered after the state legislature reduced film tax credits in 2009 and a California studio that had been interested in the project pulled out. Despite the failure of the studio project, Norristown’s revitalization efforts continued. Five Saints Distilling, a microdistillery, opened in 2016 in the old Humane Fire Engine Co. No. 1 building at 129 E. Main Street. Norristown officials expected a boost to the town’s economy with a $200 million project to construct a new justice center and renovate the public square on the government campus. An extension of Lafayette Street was expected to improve access to Main Street and the riverfront area and provide Norristown with its own interchange on the nearby Pennsylvania Turnpike. Montgomery County Commissioner Josh Shapiro (b. 1973) described the project as “transformative” – another step in Norristown’s search for a renaissance. Bean, Theodore W., ed. History of Montgomery County Pennsylvania, Vol. II. Philadelphia: Everts & Peck, 1884. Coll, Jack and Brian Coll. Norristown Then and Now. Charleston, S.C.: Arcadia Publishing, 2005. Goldstein, Sidney. The Norristown Study: An Experiment in Interdisciplinary Research Training. Philadelphia: University of Pennsylvania Press, 1961. Heysham, Theodore. 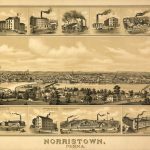 Norristown 1812-1912: A Brief History of the Borough Norristown. Norristown: Norristown Herald Printers, 1913. Hunsicker, Clifton S. Montgomery County Pennsylvania: A History, Vol. I. New York: Lewis Historical Publishing Co., 1923. Huskey, Stan. Remembering Norristown: Stories from the Banks of the Schuylkill River. Charleston, S.C.: The History Press, 2009. Toll, Jean B. and Michael J. Schwager. Montgomery County: The Second 100 Years. Norristown: Montgomery County Federation of Historical Societies, 1983. Tolle, Michael E. What Killed Downtown? Norristown, Pennsylvania, from Main Street to the Malls. Norristown: Michael Tolle, 2012. Fioriglio, Tony. “Norristown a key stop on the Underground Railroad, scholar says.” Norristown Times Herald, February 3, 2013. McChrystal, Laura. “New Stage for Norristown’s Future?” Philadelphia. Inquirer, January 18, 2016. Municipality of Norristown. 2015 Annual Report. Puleo, Gary. “Author claims Norristown a symbol of down America’s decline.” Norristown Times Herald, January 17, 2013. Puleo, Gary. “Under the Gun: Increase in crime in Norristown can be traced to economic decline.” Norristown Times Herald, June 1, 2013. Rotenberg, Carl. “Norristown Rising: Theaters inspire community engagement.” Norristown Times Herald, May 4, 2015. Shields, Jeff. “Proposal stands to eliminate mayoralty.” Philadelphia Inquirer, December 29, 2003. Urban Partners. Norristown Economic Revitalization Strategy Update, Final Report. 2009. Wanger, Irving P. “The Forming of Montgomery County,” in Sketches of Montgomery County: A Collection of Papers Prepared for the Historical Society of Montgomery County, Pennsylvania, Vol. IV. Norristown: Historical Society of Montgomery County, 1910. Historical Society of Montgomery County, 1654 DeKalb St., Norristown, Pa.
Centre Theater, 208 DeKalb Street, Norristown, Pa.
Elmwood Park Zoo, Harding Boulevard and Chain Street, Norristown, Pa.
Five Saints Distilling, 129 E. Main Street, Norristown, Pa.
Montgomery County Courthouse, 2 E. Airy Street, Norristown, Pa.
Norristown Farm Park, West Germantown Pike and Barley Sheaf Drive, Norristown, Pa.
Theatre Horizon. 401 DeKalb St., Norristown, Pa.